Gerald Hancock, author of ‘Goyt Valley Romance’ – and sadly no longer with us – kindly allowed me to scan his collection of Goyt Valley photos when I first started this website back in 2010. The photos were very much the inspiration for my research into the history of the valley. I’ve always enjoyed trying to trace the various buildings and people captured in the images. One photo has always particularly intrigued me. Gerald captioned it ‘The Bottom Lodge; Mrs Pickup kept a shop here’. But I’ve never managed to find where it was located. I’ve just finished creating a number of ‘then & now’ fades of the Goyt, all the way from Goyt’s Moss in the south to Taxal in the north (click to view). And I noticed a building marked ‘Lodge’ close to the village of Fernilee. I’ve created this fade between the 1888 map with today’s satellite view of the same area today. The building lay at the end of the lane leading from the gunpowder mill up to the Long Hill road between Buxton and Whaley Bridge. The factory is just out of the frame at bottom left. The northern edge of Fernilee Reservoir is visible at the bottom of the satellite view. I may be completely wrong about the building. It could be situated somewhere else entirely. But I believe the Grimshawe family used this lane as their main route coming and going from their Errwood Estate. And it does look like a typical Victorian-style gatehouse. So my guess is that it could fit the bill. But I said the same about the shrine on Goyt’s Lane. And I was completely wrong about that! If anyone knows about the building, please leave a comment below. Or send me a message. 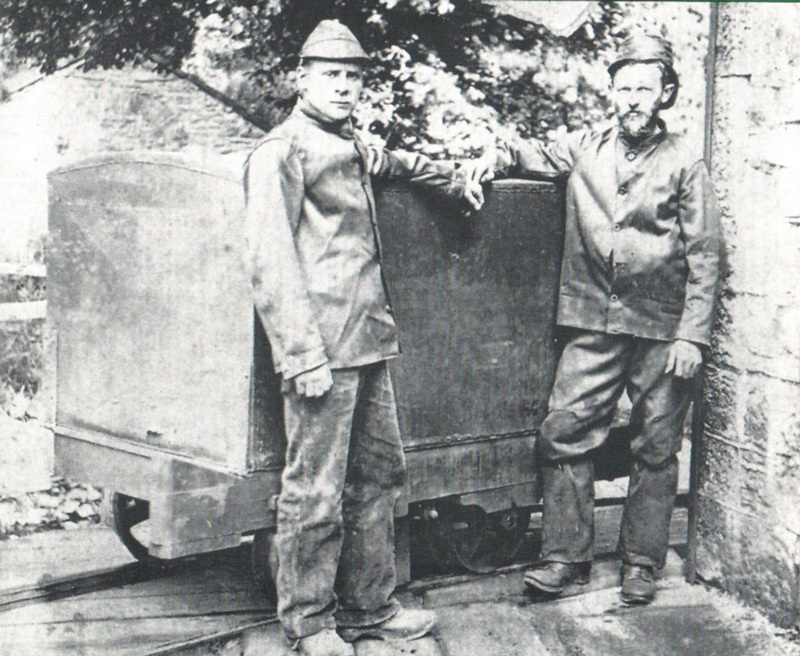 Above: This photo shows William Simpson on the left alongside a co-worker at the gunpowder mills (click to enlarge). It features on the cover of Joyce’s wonderful history of the factory, the ruins of which now lie beneath the northern end of Fernilee Reservoir. William Simpson, cousin of the Rev. Willie Simpson of Chinley Independent Chapel, came to the valley to work at the Powder Mills when he married Letitia Lomas. 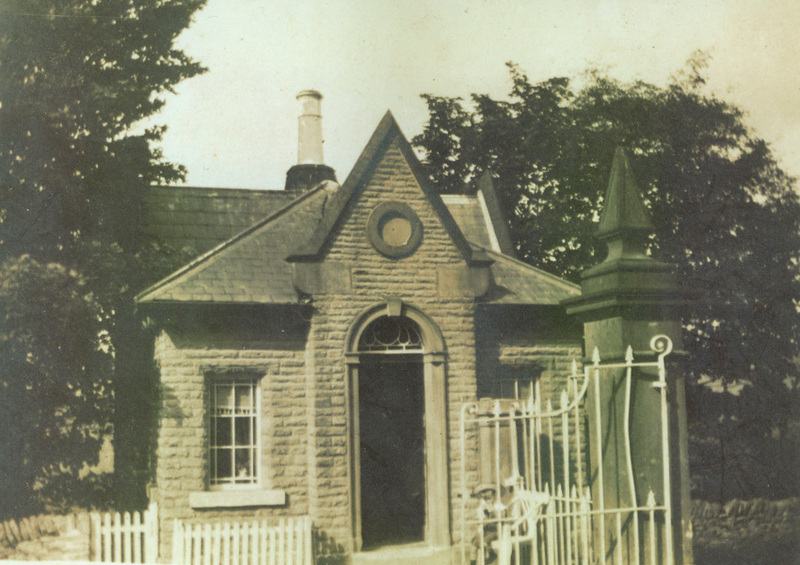 Their first proper home was Top Lodge, that tiny gatehouse built of dressed stone which used to guard the entrance to the Errwood estate, and there they stayed until 1937. Life wasn’t easy bringing up three children without water, gas or electricity. Water had to be carried from the well across the road down through a trap door to the cellar-kitchen and clean washing carried back the same way to the line near the well. Fruit and vegetables – for which William won prizes – were grown on a piece of ground at the back until the Water Board took it from them. Letitia Simpson had it hard from the beginning. Her father, John Lomas, had been a blacksmith in Sheen. When he died of a heart attack at 39, his wife, Rachel, pregnant with their fifth child, took the children and set off at 4.30 in the morning to find work at Burbage Laundry. By washing blankets with a dolly tub, and peg working in the fields, Letitia supplemented Rachel’s income to a small degree. Enough only for food, so when the rent went unpaid the bailiffs took all but the table and chairs and the mattresses. No bitterness followed these early hardships. No matter how little there was in the pantry, there was always a place at the table for a visitor, and a chalk cross on the well was the tramps’ sign that a meal would always be provided. Today – or last week to be accurate – there’s no building at the point where your lodge appears on the map. I’ve found an Alfred (b.1861) and Mary (b.1864) Pickup in the 1891 census, living in Haybottom, Taxal. He is listed as a general labourer and she a cotton winder. In both the 1901 and 1911 censuses they were living on Buxton Road, Whaley Bridge. Albert and Mary had 4 (found) children, James, Florence, Hilda and Nellie. James married Lena (Hutchinson) and lived in Yorkshire in 1911 census. Mary Pickup may well be the shopkeeper mentioned in Gerald’s caption. If you follow this link on the Furness Vale Local History website and scroll down to the “School Group” photograph there is mention of The Lodge. A school photo of the early 1890s shows Thomas Wilson who was born at The Lodge, Fernilee in 1881. This interests me: Mrs Mary Pickup was born Mary Bates, and was my great-aunt, although I never knew her. Her sister Sarah Ellen Bates married my Grandfather Alfred Hulme, but they died before I was born. Among some family relics I have a picture of the old Horwich End Post Office, which was run by their brother Eli Bates, and on the back is written ‘E Bates 1928 / from Bottom Lodge, Goyt Valley / Moved to Start Lane?’. Not that it helps identify the building, but it might help someone. I think this is the gatehouse at the top of the Valentine, which is what we call the road leading down to Fernilee Reservoir, and what used to be the drive to Errwood Hall via the gunpowder mill. It was demolished before I was born, maybe in the thirties when the reservoir was built. William Simpson lived there with his family. It was a pretty house; tiny and on three levels his daughter, Mary, told me, and the trough across the road on the map was called Simpson’s Well, which is where they got their water. I remember in the late 1980s parking on the main road at the top of the lane down to the Fernilee Reservior becuase of heavy snow. I noticed a strange wall below the parapet wall at the top. I wondered about it at the time but thought maybe it was an electricity substation or something. It would have been in the right place. Yes it is Top Lodge. The bottom story of the building is still there but it’s below the road level in the trees. If I remember there is a blocked up doorway and a window.